cause I started it about 3 months ago and it’s still a work in progress. But at least I’ve got all the drawers in it now. The last one was for router bit storage. 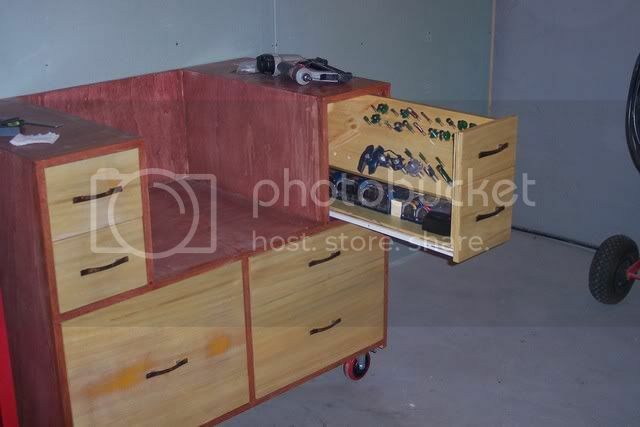 Initially I planned on making this two drawers, but then I noticed what Sawdustroad was doing with his table and came up with this idea. Special note – Thanks for the idea Sawdust! It would be much better if it had full extension drawer slides on it but I went with what I had for now. I’ll upgrade to full extensions slides if I ever get it completed. You are making progress. Making it mobile is a good idea as well. I am looking forward to seeing the completed project (as I am sure that your are too). Fancy! The inset doors look nice. Personally, I am starting to hate using those white slides, I have not had any luck with them. I kept a bunch from my kitchen and they just seem to stick at the end. I will probably keep using them just to recycle, but I wont buy them anymore. Motivational speech: Finish it! All you have to make is the top now. A couple doors? No problem. Then you can route to your hearts content. If I can see one thing I might change it would be the drawers. By the time you put a door on the front of the router housing you will be cursing the side opening drawers. I used full extension slides on mine and got 3 drawer per side so this could be something you could change now or after you have used the stand for a bit. 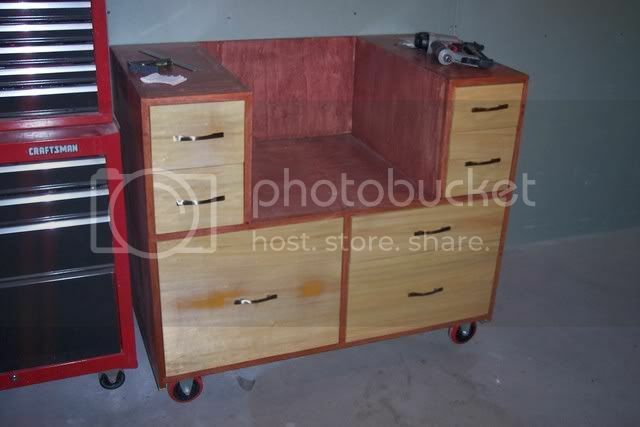 Nice looking router table. I need to build a place to hold my bits. I like the angled bit storage. Great looking table. The drawer is real nice. What are you doing with the rest of the drawers? Shaun, Nice project. I like the different colors. Do a set of those casters lock to keep it from moving? You may be slow, but it looks like it will be well worth the wait! This is my first look at your table, I really like it. I especially like the bit drawer. You’ll be paid in full, when you’re able to start using it. I agree with ya on the slides Giz, I thought I’d save a couple bucks but in the end ya get what ya pay for. If it wasn’t shop furniture I would have tossed them already. Bob#2 – I think I follow what you’re saying and honestly hadn’t thought about that. I’m glad you mentioned it. The top right hand drawer is the only one set up like that. I”m going to keep that in mind when I set up the router bay door. I might be able to avoid that aggravation if I set the door up to open from the right. THANKS! 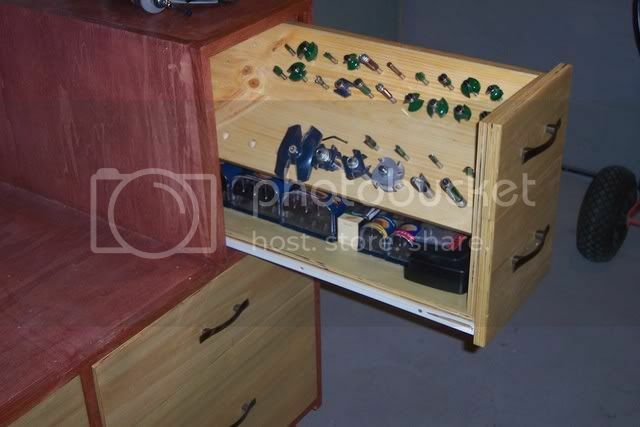 Gary – the rest of the drawers are just general storage. In fact the drawers in the top section are the only ones that are holding stuff that has anything to do with the router. 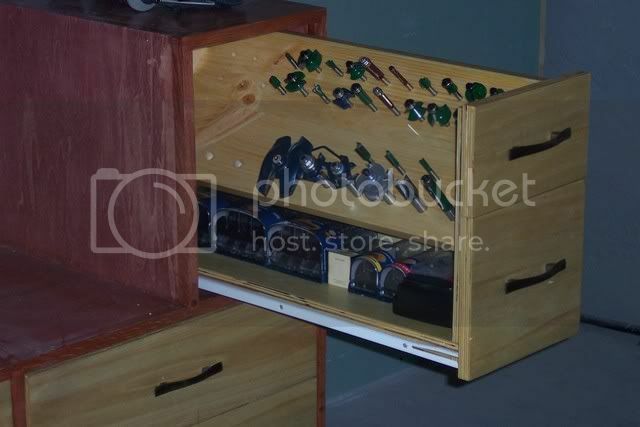 Tom – ya cant really tell in the pictures but the set on the right are swivel casters with locks. Even with the swivels it’s a challenge to drive this thing around the shop. I got a little carried away with the size.